Ive been getting a lot of questions regarding beard grooming and shaving tips. 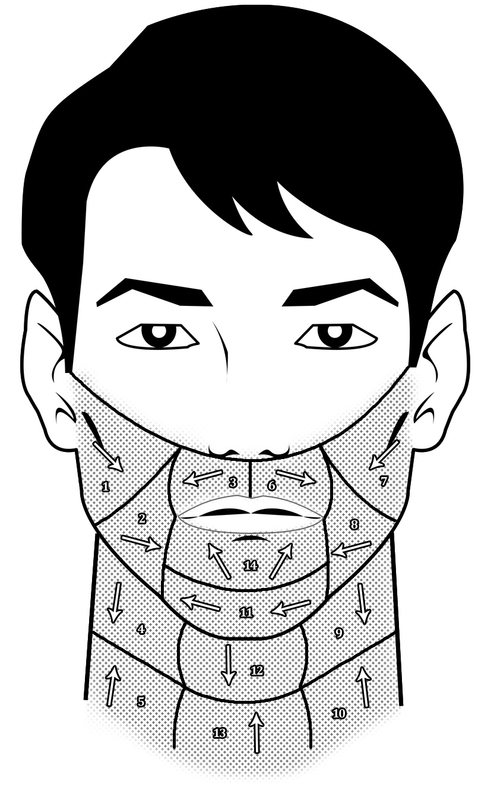 If you are, for some reason, looking to shave your beard, here are the steps you need to follow. This will allow your pores and follicles to open and reveal more of the hair shaft. Check to make sure the hot towel won't burn you. If the towel is too hot, let it stand for a minute or until it cools down. The hot towel will soften the cuticle layer of your hair and it'll stimulate the sebaceous glands. You'll be using this hot towel again after you apply shaving cream. Rubbing time should be between 1-2 minutes. Lathering will clean your face, make the hair you're about to shave stand up, and it creates a smooth surface for your razor to glide upon. Completing the hot towel usage twice will only prepare your hair and skin more. Dense and coarse hair benefits most from this. Performing these steps in the direction shown will prevent cuts, nicks, razor burn, ingrown hair, and irritation. Shave with the grain of your hair! Do not rub the skin roughly or apply a high PH astringent. That will cause the skin to become irritated and overly sensitive. The toner or mild astringent will “close up” the pores and follicles. Not following post shave steps will allow bacteria to spread and infect your pores. Dirt in the air will find its way into your pores and follicles. Dirt in follicle / Too much pressure applied while shaving = "Ingrown Hair"